Senate President, Bukola Saraki, has assured Nigerians that the current leadership crisis at the National Assembly would be amicably resolved for the growth and progress of the nation. 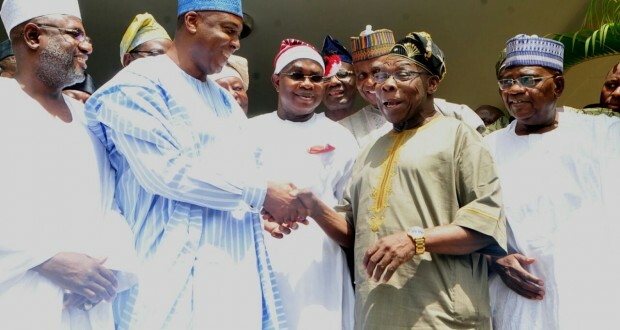 He was speaking in Abeokuta, the capital of Ogun State in Southwest Nigeria, after a closed door meeting with a former President, Olusegun Obasanjo, at his residence. Dr. Saraki also told reporters that the leadership of the National Assembly was ready to make the necessary sacrifice in view of the economic situation in the oil rich nation. Days to the election of Dr. Saraki as the Senate President, the leadership of the All Progressives Congress (APC) had chosen Senator Ahmed Lawan for the position of the Senate President but Saraki and some members of the party rejected the choice of Mr Lawan, saying it was a form of imposition. The disagreement further deepened when some Senators, who are members of the APC, and some other Senators, who are members of the Peoples Democratic Party (PDP) elected Senator Saraki as Senate President in the absence of other APC Senators who had left the National Assembly complex for a meeting with President Muhammadu Buhari. The party expressed displeasure with the process that brought Senator Saraki in, describing it as treachery. To resolve the rift, the leadership of the party, days after, said it had recognised the the leadership of Senator Bukola Saraki. Dwindling revenue occasioned by the falling price of crude oil, which is the nation’s major source of revenue, had led to the establishment of some austerity measures by the out-gone administration of President Goodluck Jonathan. The situation had taken its toll on some states’ government, with Governors finding it hard to pay some workers salaries, since their allocations had dropped. The Governors are seeking a bailout from the Federal Government. The Senate President had on Thursday said the Senate would effectively carry out its supervisory role to ensure that revenue leakages were blocked. The Senate President was accompanied by Senator Andy Ubah, Hammed Yerima, Danjuma Goje, former factional leader of the Peoples Democratic Party, (PDP) Kawu Baraje, former Governor of Osun State Olagunsoye Oyinlola.